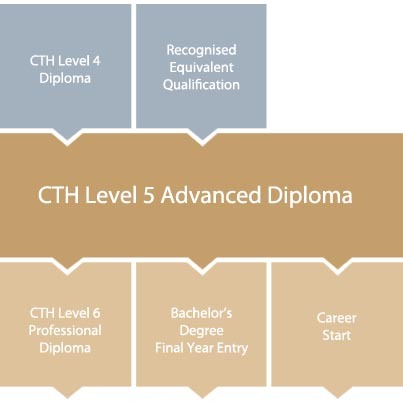 The CTH Level 5 Advanced Diploma in Tourism is a substantive management programme, typically taught over a nine month period and designed to provide students with direct entry to the final year of a university bachelors degree. The course aims to provide students with an understanding of the managerial, decision-making and leadership aspects of the tourism industry. In addition it is also designed to develop independent research and study skills required when working at senior managerial level in the industry. Therefore, the Level 5 Advanced Diploma is an excellent preparation for either entry to the workplace or as a springboard into final year bachelors degree level study. Entry is available to graduates of the CTH Level 4 Diploma or an equivalent approved qualification. Students must have a minimum English proficiency of IELTS 5.5 or an approved equivalent. Students who do not satisfy the English language requirement may choose to combine this programme with CTH’s English for Hospitality & Tourism.